Ria Loves Pawlish: My First Stamping Mani! 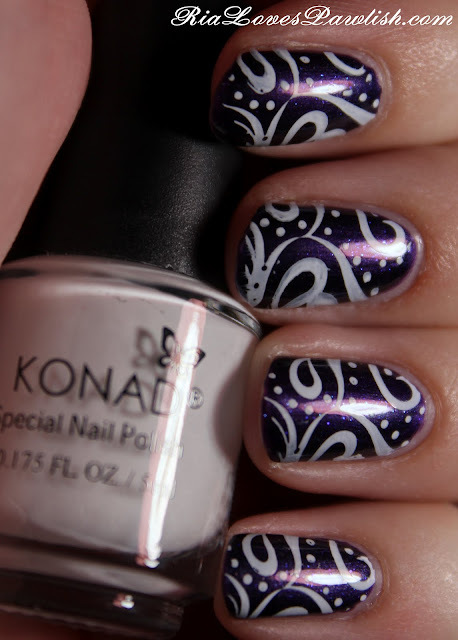 Konad White dries dull and seems like it would pick off easily, so you definitely want a topcoat. i used my trusty Seche Vite! it looks great!! was it hard to do it on the sides of the nails, like when you curve around the nail? I've always wondered, if you have to move it over the curve to hit the sides or if it all works out. thank you :D it's actually easy to do that, you just roll the stamper over your nail. the rubber stampy part is curved and squishy! You did an awesome job!! Isn't stamping so much fun? It gives you so many new options when doing your nails that you didn't have before! You did awesome! Looks beautiful! I love stamping it looks so crisp and neat and is so much easier than freehand!